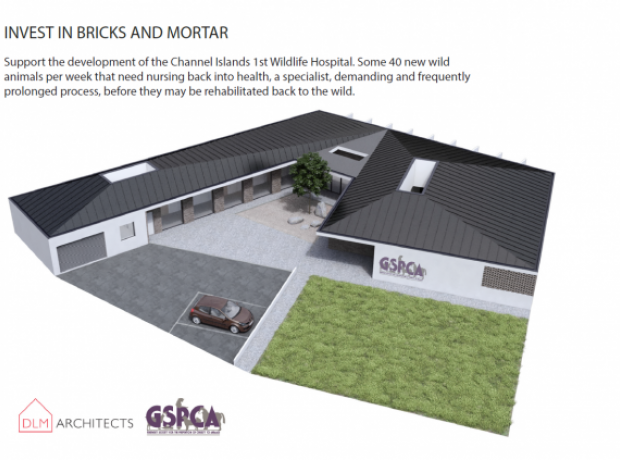 If you have visited one of the GSPCA recent events or stalls you may well have learned of the newly launched ‘Buy a Brick’ campaign to help the GSPCA achieve the propose new Wildlife Hospital. The GSPCA currently treat over 2,000 wild animals and birds each year, this number continues to increase and our existing facilities can’t cope with the increase in demand, and are not fit for purpose. They desperately need a radical reorganisation and updating. From seal pups to baby hedgehogs, kingfishers to buzzards, ducklings to loggerhead turtles, bats to voles the variety of wild animals and birds GSPCA help is vast. To help achieve the new Wildlife Hospital we are launching our Exclusive Build Partner scheme and a Buy a Brick Scheme for individuals and businesses looking to support this much needed build. Option 1: £250 have your family name or company logo engraved on a brick which will feature in the build of the Wildlife Hospital. Option 2: £50 buy a brick for the build. Multiple brick packages are also available. To download the Buy a Brick leaflet please click here http://www.gspca.org.gg/sites/default/files/Buy%20a%20Brick%20Wildlife%2... . The next events we will be attending with our Buy a Brick leaflets will be Discover Dogs at Beau Sejour on Sunday the 14th October and the Wellbeing Fayre at Beau Sejour on Monday 8th October. Leaflets and further information are available at the GSPCA. DLM and the GSPCA are delighted to showcase the proposed designs for the new GSPCA Wildlife Hospital and launch the Build Partner Scheme. "With 1,500 to 2,000 wild animals and birds through the doors every year we see more wild animals come into our care than domestic species and we have been helping this number of animals for many years and it looks likely to continue and with the buildings we care for the wildlife dating back many decades a new facility fit for purpose and the future is essential and we are appealing for support." "From seal pups to baby hedgehogs, kingfishers to buzzards, ducklings to loggerhead turtles, bats to voles the variety of wild animals and birds we help is vast." "To help achieve the new Wildlife Hospital we launched our Exclusive Build Partner scheme for those businesses and individuals looking to support this much needed build." "We are asking for 350 Exclusive Build Partner to sign up for a minimum £520 a year for 5 years or a total of £2,600 per partnership and would love to hear from anyone that would like to get involved with this or any fund raising or donations towards our Wildlife Hospital new build." "If anyone would like to learn more or discuss how they can get involved and support our Wildlife Hospital new build please do get in touch by calling 01481 257261 or email stevejbyrne@gspca.org.gg." DLM & The GSPCA are meeting to discuss the proposals with the Planning Department next week. The Build Partner programme is designed to meet the building costs associated with our new Wildlife Hospital Building. The building is to replace a number of existing structures that are scattered across the site that have become unusable with age. If anyone would like to learn more or discuss how they can get involved and support our Wildlife Hospital new build please do get in touch by calling 01481 257261 or email stevejbyrne@gspca.org.gg. DLM Architects is an award-winning RIBA chartered practice. They believe that architecture should not just be seen as a statutory requirement, but be viewed as an opportunity to maximise the potential of your investment and the enjoyment of your home. They provide a full service from conceptual design through to completion allowing a more efficient and refined solution to their clients brief. Each year the team at DLM choose a charity to provide pro bono work on, this years charity is the GSPCA. The shared ethos of our team is to develop high quality progressive architecture that embraces heritage and challenges convention. Their highly skilled team believe that they have a social responsibility to improve our environment and enhance the landscape of our island. They create architectural responses, informed by specific site conditions, the ways in which people utilise and inhabit spaces, and the unique and varied ways in which we each choose to live. Their bespoke services incorporate concept design, planning and building licence applications, construction detailing, contract administration and project management.